He has a tattoo of the molecular structure of an atom on his left arm; it looks like five legs connected to a pentagon shape with a sixth line sticking out of the pentagon. 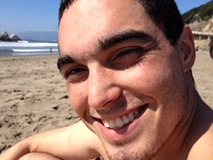 Curran was last seen on October 18, 2014 in San Francisco, California. He has not been seen since. Few details are available in his case, which remains unsolved.